LOVE keeping your COLD food COLD and HOT food HOT? Then the Busy Life LARGE Thermal tote is for you! This is your best everyday solution for your busy life. • One of our favorite uses is sliding in carry-out pizza to bring it home warm. The shoulder strap even slides out to allow carrying the tote horizontally so the cheese doesn't stick to the lid ! • Interior is easy to wipe clean when needed.
? Busy Life Products is a small family owned American business. We are a BUSY family making products for BUSY people. We use our products and love them!
? We are so confident you will love it too, that we offer 100% SATISFACTION Guarantee. We take care of our customers, so when on occasion if something is not right, we make it right!
? 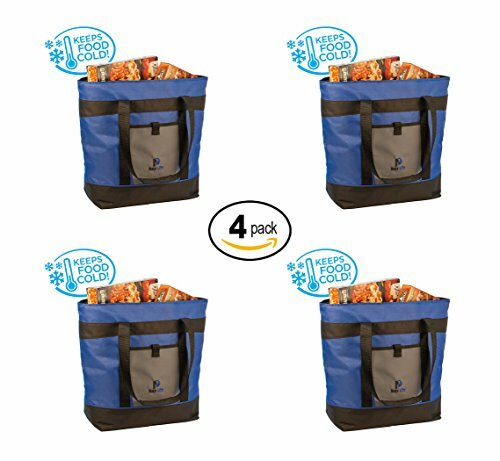 Enjoy our Insulated Grocery Bag, RISK FREE by clicking the orange "Add to cart" button at the top of this page! MELTED ICE CREAM IS A THING OF THE PAST - Heavy insulted walls allow our collapsible cooler bag to keep your freezer and cooler items cold ?? for hours. Extra large capacity - 21 L (across the middle) x 7.5 W x 17 H provides room for all your cold items! DON'T FORGET THE PIZZA - When you bring home the carry-out pizza this thermal bag is designed to keep it warm. Radiant interior liner reflects heat keeping hot foods warm. Zip the bag closed quickly to hold in the heat. The shoulder strap slides out to allow carrying the tote horizontally so the cheese doesn't stick to the lid. Now who's the favorite parent! USA-BASED COMPANY, PERFORMANCE GUARANTEED: Busy Life Products was started by a BUSY family for BUSY people. We use our products and love them. We are so confident you will love it too that we offer a LIFETIME GUARANTEE. We take care of our customers, so if something isn't right, simply let us know and we'll give you a 100% refund or replacement. If you have any questions about this product by Busy Life, contact us by completing and submitting the form below. If you are looking for a specif part number, please include it with your message.